WARSAW (Reuters) - Poland's Prime Minister Beata Szydlo is recovering quickly from a car crash last week but will remain in hospital for the next few days, the government spokesman said on Monday. 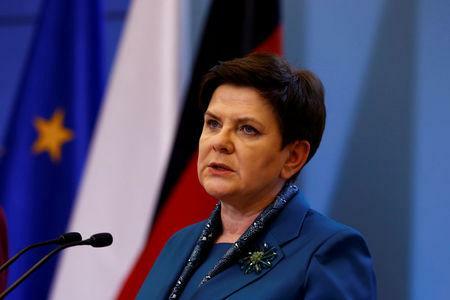 Szydlo was hurt when her car struck a tree in a crash in southern Poland on Friday. She was flown to a hospital in Warsaw and very few details about her condition have been made public. Her accident raised serious security concerns, given it was the third collision involving a senior official since the eurosceptic Law and Justice (PiS) came to power a little more than a year ago. Rafal Bochenek, the government spokesman, read a doctors' statement saying her injuries have not required any surgery. "The nature of the injuries and the progress in treatment and rehabilitation promise a quick recovery," Bochenek said. He added that she did not suffer any broken bones. Szydlo will skip Tuesday's scheduled cabinet meeting and will remain "for observation" for the next several days. The cabinet session will be headed by First Deputy Prime Minister Piotr Glinski. Bochenek said Szydlo has been able to work from hospital and has met with government officials and colleagues. The cause and circumstances of the collision are under investigation. Local police said Szydlo's car was in a convoy overtaking another car and veered off the road to escape hitting that vehicle, which suddenly turned left.